"Give what you can and make a difference," their motto says. The hard-working, dedicated staff of the King George VI Memorial Home for the Aged give those eight watchwords meaning to the residents. But the home needs more support to keep doing the work they do so well. In total, there are 22 paid and volunteer staff members at the King George VI Memorial Home, which is located in the east end of Freetown on the Grafton/New Regent Road. Mrs. Hannah I. Deen (sitting almost center in pink traditional print with the residents) is the treasurer of the not-for-profit organization. She said the home is a charity and sponsored by annual donations from individuals, businesses, and organizations in the community. Every year, the Rokel Commercial Bank gives the home Le10Million in cash and sometimes in-kind donations also worth about Le10 million. The new toll facilities in Sierra Leone were built by a Chinese company in partnership with the government. Road travelers are expected to pay for passing through the highway over the next 25 years. There are three toll gates along this main highway linking Freetown to the Provinces. One at Hastings, 15 miles east of Freetown, another at Songo, and the last at Masiaka, which is 40 miles (65 km) from Freetown. So if a bus, a truck, or a poda poda is traveling from Freetown to the provinces, they have to go through all three gates, and when they return, they will pass all the toll facilities again. Truck drivers, taxi drivers, motorcycle riders, private vehicles all have to pay tolls. Cars pay Le2,000, poda podas, Le4,000; trucks, Le200,000; Okada motorcycles, Le1,000; taxis, Le2,000; and buses pay Le20,000. If a truck is traveling to Bo city, to and fro, it will cost the driver Le1,200,000. In just over a 100 days, Sierra Leoneans will go to the polls to elect the President, Parliament and local councils. The three major candidates in the 2018 presidential election are foreign minister Samura Kamara, who is the All People's Congress (APC) presidential candidate; retired Brig. Maada Bio, presidential candidate of the opposition Sierra Leone People's Party (SLPP); and Kandeh Yumkella, a former director-general of the United Nations Industrial Development Organization, who is the candidate of the newly formed National Grand Coalition (NGC). Yusuf Bangura, a political scientist who has taught in universities in Nigeria and Canada and worked as a visiting researcher in Sweden, makes a case for change in 2018. On my last day in Freetown recently, I visited Solomon Berewa, Sierra Leone’s former Vice President and unsuccessful presidential candidate in 2007, at his Goderich home. He is now very old and retired, but his schedule seemed busy. 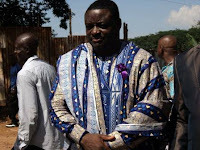 When I called a week earlier, he was on his way to Bo; and he had attended the Sierra Leone Peoples’ Party (SLPP) national convention two days before that. I was interested in his views on that. 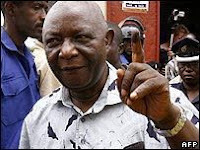 But I was more interested in his recollections relating to the Sierra Leone government’s negotiations with the Revolution United Front, which he had led both at Abidjan and at Lomé (the conversations relating to that are not published here). A day before I met him, he was interviewed by the AYV for its early morning political programme [broadcast]. Latest reports from Sierra Leone say the All People's Congress (APC) political party has chosen Samura M. Kamara as their presidential candidate. The APC held its national convention this weekend, allowing for party leaders, activists, and supporters to select their nominee for the upcoming elections. General elections will be held in Sierra Leone on March 7, 2018, to elect the president, Parliament, and local councils. Incumbent President Ernest Koroma is not running, as he is constitutionally ineligible, having served the maximum ten years in office. When Kamara, then Sierra Leone's foreign minister ran for the top job at African Development Bank, Sierra Leoneans around the globe rallied behind their man. Radio listeners registered their support through text messages, while those on WhatsApp, Twitter, and Facebook posted messages of solidarity. 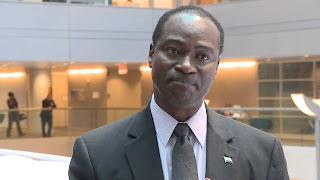 Yusuf Bangura is a Sierra Leonean-born United Nations economist who resides in Switzerland. Dr. Bangura is a Muslim. Here he comments on the sermon that recently sent ripples through the small West African nation which suffered almost a decade of war. 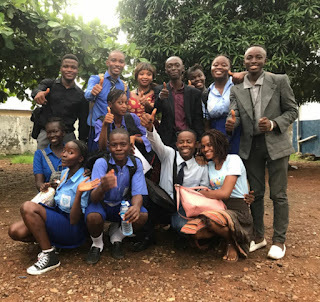 Sierra Leone has long prided itself as a country that has maintained authentic religious harmony because of positive attitudes to faith among its citizenry. Victor Ajisafe’s sermon of 25 September 2017 in which he denounced Islam as a religion of terror and denied Islam’s existence in Sierra Leone infuriated the nation, with many calling for a complete shutdown of his church, an apology, and his deportation. 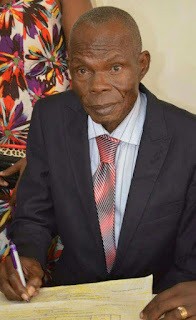 The government acted swiftly by arresting Ajisafe, temporarily suspended all activities in the six branches of his church (Christ Revival Evangelistic Ministries), and closed down his radio station. Andrew Keili comments on faith, culture, society, and politics in Sierra Leone. This week a Nigerian-born pastor was arrested after recordings of a sermon targeting Muslims went viral sparking condemnation by both Muslim and Christian Sierra Leoneans. Ajasafe to Mufti Menk: "Let Your Gate Be Closed"
A fire and brimstone sermon by Victor Ajisafe has landed him in hot water with the government of Sierra Leone. Ajisafe, a native of Nigeria, and the founder and pastor in charge of the Christ Revival Evangelistic Ministries located off Kingharman Road in Freetown was today issued a temporary suspension of the registration of his Sanctuary Praise Church by Sierra Leone's Ministry of Social Welfare, Gender and Children's Affairs. In an open letter from the social welfare ministry dated 26th September 2017, chief social services officer, Joseph S. Sinnah, said the action was taken “following the dissemination of a video/audio recording attributed to” Ajisafe. In the audio, Ajisafe condemned the recent visit of Zimbabwean Grand Mufti Menk at Sierra Leone's State House to meet President Ernest Koroma, while on an inspirational tour to the post-war country, which suffered devastating floods and mudslides in August. Coming a week after Freetown buried almost 500 people, the news that its city cemeteries have become playgrounds for criminals couldn't be worse. In October 2014, the first group of more than 10,000 dead Sierra Leoneans, who succumbed to Ebola-related symptoms, were buried in Pa Loko village, Waterloo. At the height of the Ebola outbreak, the 12-person burial teams managed by an Irish humanitarian organization buried up to 85 bodies per day. When the Ministry of Health and Sanitation ran out of burial plots (Sierra Leoneans frown on cremation) the Government of Sierra Leone purchased land about 20 miles east of downtown for an undisclosed sum. The Ebola cemetery at Waterloo is reportedly spread over ten thousand acres. Once the Irish charity left, The Western Area Rural District Council acquired management of one of the largest cemeteries in the country. Sierra Leone's State House has proclaimed a seven-day National Mourning period, as the nation begins to come to terms with devastating floods and mud slides that have left hundreds of people dead and entire communities buried under mud. The week of mourning event has been organized around rescue and clean-up efforts, shored up by Army personnel activated by President Ernest Koroma in response to the humanitarian crisis. Red Cross officials estimate that 600 people are still missing after heavy rains and flash flooding led to landslides in the west African nation of Sierra Leone on Monday. More than 300 people are dead and local residents say they expect the death toll to continue to rise. According to weather.com meteorologists, the area has seen nearly 20 inches more rain than average over the last 30 days. 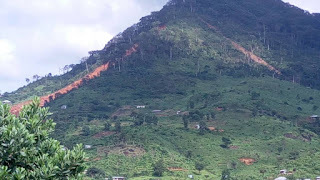 Private sector and #UN working together to map disaster area and predict risk of new landslides. President Ernest Koroma addressed his crisis-stricken nation on Monday in a moving speech acknowledging the devastation but urging calm after a day of flooding and landslides in Sierra Leone's capital. Here's a transcript of what he said followed by a raw video after the jump. Fellow Sierra Leoneans, our nation has once again been gripped by grief. 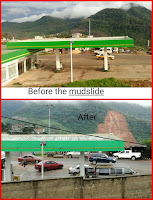 Many of our compatriots have lost their lives, many more have been gravely injured and billions of Leones worth of property destroyed in the flooding and landslides that swept across some parts of our city. I am very disturbed by this national tragedy and with a heavy heart, let me extend profound condolences to the bereaved families. This is not a tragedy for you alone; it is a tragedy for every Sierra Leonean because the people who have perished in this disaster are our compatriots. Every single family, every single ethnic group, every single region is either directly or indirectly affected by this disaster. The Auditor General of Sierra Leone released a list Monday naming government agencies and institutions that have failed to submit their financial statement for the purpose of auditing. The list includes the University of Sierra Leone, national stock exchange, and 10 bodies, including the Small Arms Commission, which haven't submitted financial statements since their formation. "Having failed to submit their financial statements for auditing, these institutions should therefore collectively account for billions of Leones of public money they received as budgetary allocations/subventions," the press release said. Kama Dumbuya, a former Sierra Leone center forward who spent time with East End Lions, Blackpool, and Freetown United, football clubs, died Friday, June 16, 2017, the Sierra Leone Football Association announced. Kama, whose flashy style, rugged looks, and charismatic personality left an indelible mark on west African football, passed away at Freetown's Connaught Hospital. Reports say he was in his 70's. The cause of death is unknown. Considered the king of soccer in his heyday, Kama “made a whole pavilion lean at Brook fields Stadium,” wrote veteran sports writer Kabs Kanu. He was “one of Africa’s greatest footballers –the legendary Sierra Leone center forward of the 1960s and 70s,” Kanu added. In this undated photograph taken May 2017 in Freetown, former soccer administrator Mr. Crispin Webber embraces veteran football star Kama Dumbuya. On June 16, 1976, children in Soweto took to the streets in protest to add to the outcry started by Nelson Mandela, Desmond Tutu, Thambo Mbeki, and others in South Africa. Frustrated with segregation, the students demanded equal rights. Sadly, the demonstration resulted in the death of some 23 students. More than a hundred were injured. Recognizing the gross violations, and the role played by these children in ending Apartheid, the Organization of African Unity (OAU), now known as the African Union, ratified the AFRICAN CHARTER ON THE RIGHTS AND WELFARE OF THE CHILD. They also called for a global observance of the day, marking the horrendous attack on peaceful school pupils demonstrating against the injustice of Apartheid in South Africa.